Although I constantly proclaim cherries to be my one-true summer love, in actuality, my heart is torn in two. You see, I can't actually remember who I loved first...cherries or peaches. Growing up in Michigan, the dog days of summer meant many things. Summer meant swimsuits worn thin by long days in my grandparent's pool. Summer meant beach trips in which our car was filled to the brim with brightly hued towels, plastic buckets and shovels and rakes, ice-packed coolers, and squirmy kids itching to run down the sand and splash in the waves. Ending the day, of course, with sand in places sand should never be, and skin that was five shades darker than it was when we rolled out of bed that morning. It meant trips to the ice cream shop for cones filled with as many scoops of Blue Moon Ice Cream that mom would let me eat. It meant treks down country roads to get to back ponds, fishing poles hiked over our shoulders. It meant aunts and uncles and cousins and grandma all coming around the picnic tables lined with newspapers to scale and gut fish. And inevitably, it meant I was going to get chased around the yard with a still-moving fish head. Summer meant camping trips to the Cherry Festival in Traverse City. Cherry jam, cherry pie, cherry cobbler, cherry ice cream, dried cherries, yogurt-covered cherries...cherries, Cherries, CHERRIES! It meant orchards with twisted little trees dripping with beautiful red orbs. Sometimes red and yellow orbs. It meant balancing acts on knees and backs trying to reach higher. It meant pit-spitting contests and jugs of cherry juice for the ride home. Summer meant trips to my grandpa's small house, with Babe, the old horse in his barn across the lane eating sugar cubes, carrots, and apples from my hands. It meant spying on far-off neighbors with powerful binoculars and hopping on the CB to talk to the truckers coming down the highway (handle: Swamp Angel's Granddaughter). And it meant exploring the orchards past grandpa's old barn, accompanied by one or two stray cats with hopes that the fruit was ripe and ready to pull. It meant climbing trees and grabbing peaches soft and fuzzy in my shirt, soon to be dribbling down my chin, giving me sticky hands and arms. And so, to this day, I still think of cherries like I think of a first love. But also, peaches. When I came across a roadside stand with a few small baskets of peaches sitting at the side of the road, I grabbed up as many as I had cash for. I managed to save two from being eaten out of hand to go onto this loaf of my current favorite bread for summer (because it's quick to make, and it's so delicious). So worth it. Combine the yeast, water, and half of the sugar in a large bowl until the yeast blooms (looks creamy). Using a wooden spoon, stir in the flour and salt until the dough comes together. Turn out onto a lightly floured work surface and knead a few times. The dough should be slightly sticky - flour your hands lightly to keep the dough from sticking to them, but don't let the dough become too stiff. Flick a bit of water onto a 15"x10" (or thereabouts) rimmed baking sheet, and line it with wax paper. Pour the olive oil onto the wax paper and spread it around with your hands. Plop the dough onto the sheet, and use your hands to gently coax and stretch it into the shape of the pan. Lay a sheet of plastic wrap over the top of the pan and let sit until the dough rises up just over the edges of the pan. This could take up to 1-1/2 hours, but in my kitchen on a warm summer morning, it could happen as quickly as 30-40 minutes. Keep an eye on it. While the dough is rising, cut the peaches in half. Slice each half into 8 even slices. Place the slices in a bowl and add the brown sugar; toss gently to dissolve sugar and coat the peaches. Cover and set aside at room temperature. When the dough has almost finished rising, preheat the oven to 400° F.
When the dough is nice and puffed up, give the peaches a gentle stir. 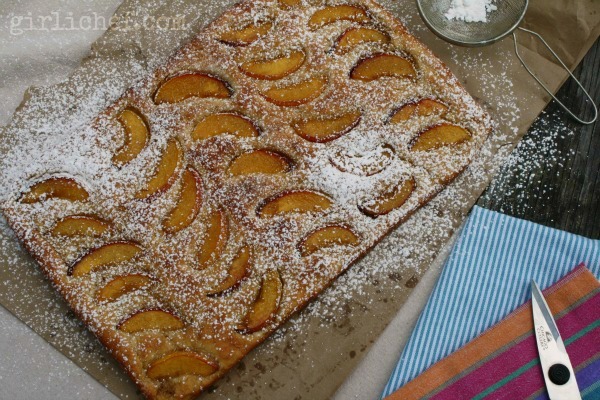 Quickly, but gently (so as not to deflate the dough), place the peaches and the brown sugar juices over the dough, either in rows or haphazardly. 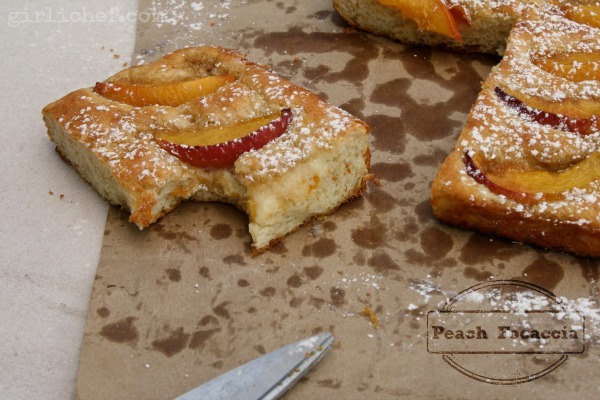 Scatter the remaining sugar evenly over the top of the dough and peaches, going right out to the edges. 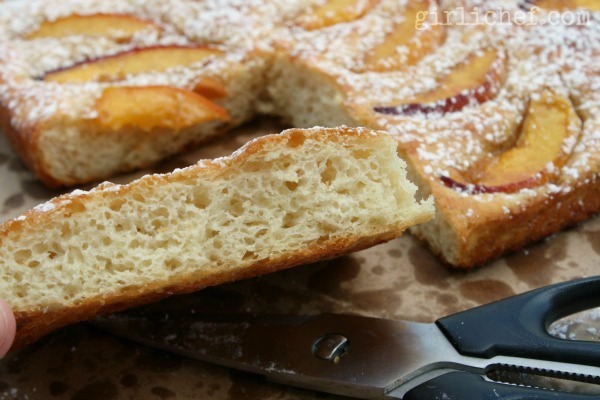 Slide into preheated oven and bake for about 25 minutes, or until the focaccia is golden and a bit crisp on the edges and the peach slices look soft and juicy. Remove from the oven, and very carefully slide the loaf out onto a wire rack to cool, peeling off the wax paper as you go. Once the bread has cooled down to room temperature, sift some confectioners' sugar generously over the focaccia, cut off pieces with kitchen scissors; enjoy! 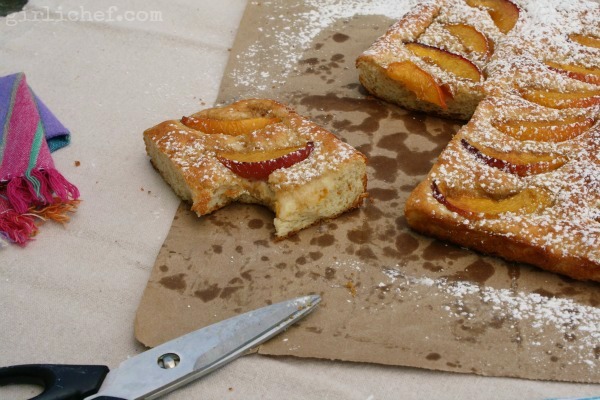 This focaccia is best eaten right away, but definitely the same day (otherwise it will get too wet from the peaches).